Refinery Feedstocks - Ensyn - Renewable Fuels and Chemicals from Non-Food Biomass. Ensyn’s biocrude is a low carbon feedstock for use in petroleum refineries for the production of renewable gasoline and diesel in an innovative and game-changing application known as Refinery Co-processing. In Refinery Co-processing, Ensyn's biocrude is used as a feedstock for the Fluid Catalytic Cracker (FCC) unit in refineries. FCC units are found in most refineries worldwide and are used to produce gasoline and diesel from petroleum feedstocks, including vacuum gas oil (VGO). When Ensyn's biocrude is processed alongside traditional FCC fossil feedstocks (at usage rates up to approximately 5%), the biocrude performs comparably to VGO on a volumetric basis producing ASTM specification renewable gasoline and diesel. Refinery Co-processing offers refiners a cost-effective method of reducing the carbon-intensity of their products. Co-processing Ensyn's biocrude produces ASTM specification transportation fuels and therefore does not require segregated handling and distribution downstream of the refinery, as is the case with ethanol and biodiesel. In addition, leveraging existing refinery infrastructure leads to low overall capital and operating costs. Honeywell UOP is Ensyn’s technology partner in the commercialization of Refinery Co-processing. 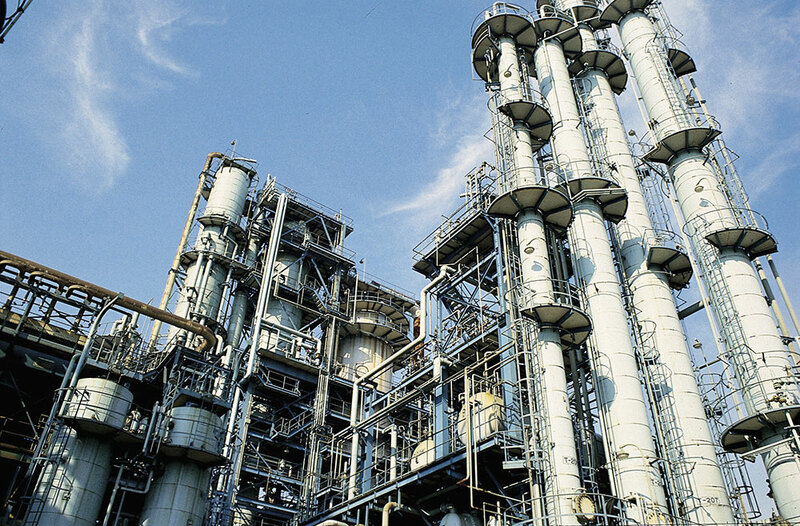 Honeywell UOP works directly with refiners providing engineering services and delivery systems allowing the refiner to integrate Ensyn’s biocrude into their FCC operations. Honeywell UOP is also Ensyn’s partner (through Envergent Technologies) in providing the RTP biomass conversion equipment to biocrude production projects. For more than100 years, Honeywell UOP has been a leader in developing and commercializing technology for the oil refining, petrochemical, gas processing and hydrogen industries. Honeywell UOP’s principal products offered to these industries are licensed technologies and processes, catalysts, adsorbents, packaged plants and key mechanical equipment. Refinery Co-processing of Ensyn's biocrude has been demonstrated in multiple trials and demonstrations in Canada, the US, Europe and South America. These trials have taken place in a variety of test, pilot and demonstration equipment, including in operating commercial refineries. A key Refinery Co-processing demonstration was carried out by Petrobras in its 200 kg/hr (~30 bbl/day) FCC facility in Sao Mateus do Sul, Brazil. 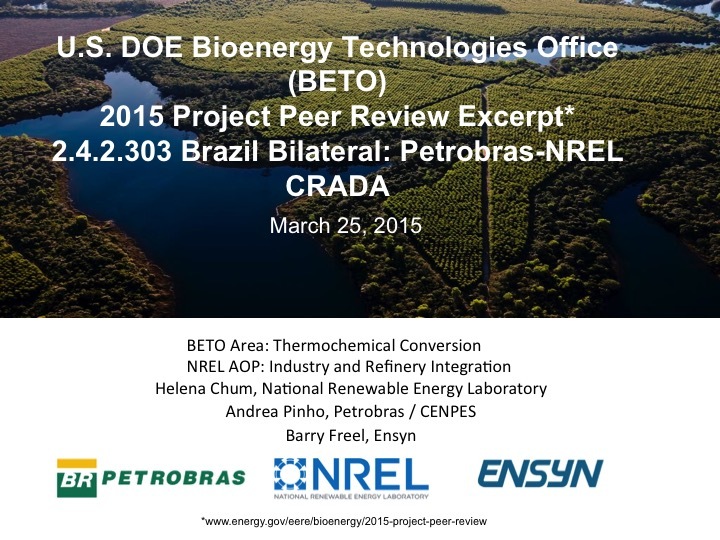 This was completed under a three way collaborative research agreement between Ensyn, Petrobras and the U.S. National Renewable Energy Laboratory (NREL). The results of this trial were presented to a peer review panel at the U.S. Department of Energy In 2015 (click for presentation). Refinery Co-processing is carried out by processing Ensyn’s biocrude in the Fluid Catalytic Cracker (FCC) unit in existing refineries alongside traditional FCC feedstocks. A key Refinery Co-processing demonstration was carried out by Petrobras in their FCC facility in Sao Mateus do Sul under a collaborative research agreement between Petrobras, NREL and Ensyn. Results were presented to the U.S. Department of Energy (presentation below).